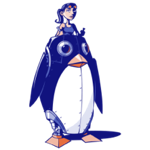 The LinuxChix GIMP course was conducted on the courses mailing list, and the lessons are archived via the list archive. The course consisted of 11 weekly lessons, starting with Lesson 0 on Jan 25, 2005. The lessons were also translated into French by Karine Delvare. In the GIMP course, we'll be doing lots of playing with digital images, and that means you'll need some raw material to work with. If you have a digital camera, then you probably have no end of images. But if you don't, this page will offer ideas for some places you can get images which don't have many copyright restrictions, at least for personal, nonprofit use. Check the copyrights on the sites for more information, but generally images on these sites will be free for personal, educational, or nonprofit uses. Of course, if you're working on something related to a for-profit business, check the copyrights carefully and make sure it's okay. Creative Commons has quite a collection of images on all subjects. You may want to consider licensing some of your images with a Creative Commons license, too. BurningWell, a repository for public domain images. The  means convert at highest resolution (3072x2048);  will convert at 1536x1024. See man imagemagick and search for photocd for the full list. These sites have good examples to look at, and of course no one will stop you from using any image for playing around on your own machine; but you may have to check with the owner of the image before redistributing anything based on these. Deviant Art Samples of art made with GIMP and other programs.